As with most major metropolitan cities in the country, Boston, Massachusetts can be reached by several US-numbered routes. The first route, US-1, passes through on its trip down the entire east coast. The longest highway, US-20, begins here and heads west across the continent. Of course, it was not the longest back in 1962. That title was reserved for highway US-6, until it was shortened by the state of California in 1964. Rounding things out is US-3, which has a much shorter journey through only New Hampshire and Massachusetts. Today, Roadtrip-'62 ™ is wandering around Boston to see tourist attractions that have been there since at least 1962. Though I will mention quite a few places, there is no way you could do them justice in a single day. I suggest at least three days in Boston, which is what I spent the last time I stayed here. Many of these attractions are related to the American Revolution, as Boston was an important center of revolutionary activity. In the years before the Revolution, Great Britain had passed several taxes that the American colonists opposed. 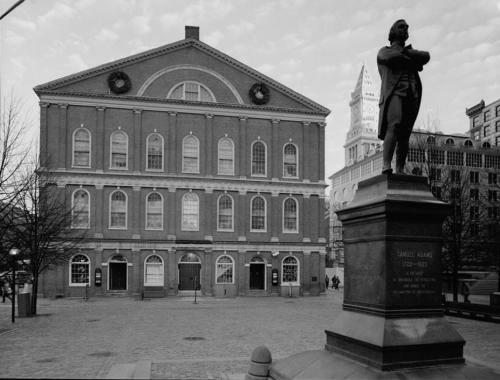 One of the most famous acts of opposition was the Boston Tea Party, and you can still visit the Old South Meeting House, where the Tea Party was planned and launched in 1773. The building was a church at that time, and the largest building in Boston. Estimates are that five thousand colonists gathered there for the protest. The British occupied the Meeting House in 1775 due to its association with the Revolutionary cause, gutting the building. They then filled it with dirt and used it to practice horse riding. They also destroyed much of the interior and stole various items of historical value. It was damaged in the Great Boston Fire of 1872 and the congregation moved out a few years later to a new church. The building was saved from demolition by a determined group of local women and has been a museum and meeting place since 1877. It was one of the nation's earliest museums of American history. Another historic site from the American Revolution is the Paul Revere House. The home was built about 1680 and is downtown Boston’s oldest building. It is also one of the few remaining 17th-century dwellings in any large urban area in the United States. Paul Revere purchased the home in 1770, just prior to the war, and he lived here when he took his famous midnight ride. He sold it in 1800, and since the site was downtown, it was used as various shops over the years. Revere’s great grandson purchased the house to prevent demolition in 1902 and worked with architect and historic preservationist Joseph Chandler to renovate it, removing several later additions. It was returned to its historic state and has been open as a museum since 1908. Another site associated with Paul Revere’s midnight ride is the Old North Church. 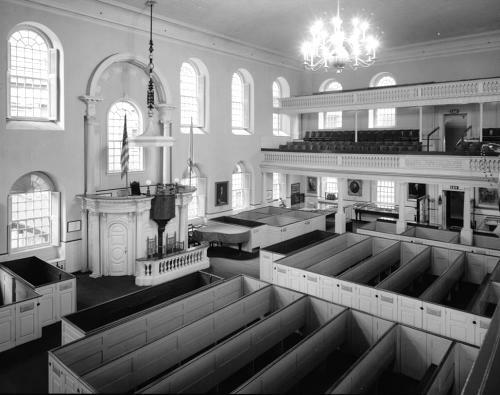 Built in 1723 as Christ Church in the City of Boston, it is Boston’s oldest surviving church building. It is also the city’s most visited historical site and is still an operating church. Its part in the Revolution occurred on April 18, 1775, when a church sexton and vestryman held two lanterns in the steeple, giving a signal that the British were marching to Lexington and Concord by sea across the Charles River and not by land. The lanterns were hung for just under a minute to minimize the chance that British troops occupying Boston would see them, but it was long enough for the message to be received by local militia awaiting the signal. The event is all the more notable because in 1775 the majority of the congregation were loyal to the British King, with many holding official positions in the royal government. The church’s campus also includes other buildings with views of colonial history, such as The Printing Office of Edes & Gill, where you can be part of Boston’s only colonial printing experience with an operating 18th century printing press. The Old State House, which is the oldest public building in Boston, was built in 1713 and served as a meeting place prior to the Revolutionary War. John Adams observed that, "the child Independence was born” here in 1761, when James Otis argued against the Writs of Assistance, the British Crown policy which permitted warrant-less searches of private homes and businesses. Otis lost the case, but his impassioned speech about the rights of privacy was one of the events that led to the American Revolution. The Declaration of Independence was later read to the public for the first time from the building’s balcony. Historical artifacts, like John Hancock’s coat, are on display in the building. It was designated a National Historic Landmark in 1960. Twice during its history, the Old State House was rented out to businesses, when not occupied as a public building. But in 1881, when possible demolition loomed, The Bostonian Society was formed to preserve the Old State House. It was renovated in 1881–1882, with replicas of the lion and unicorn statues installed to replace the originals that had been burned in 1776, and has been a museum since. One easy way to find all the historic sites in Boston is along the Freedom Trail, a 2.5-mile, route that leads you to 16 sites. The trail was organized and dedicated in 1951, and is a unique collection of museums, churches, meeting houses, burying grounds, parks, and historic markers, and even a ship. These sites tell the story of the American Revolution and more. You can get tours led by 18th-century costumed guides who tell tales of treason, mobs, revolutionary actions, and the partisan fights of the American Revolution. While wandering around Boston, I suggest stopping for lunch at Faneuil Hall. This marketplace was opened in 1742 and was the site of several speeches by Samuel Adams, James Otis, and others encouraging independence from Great Britain. It now has over 70 shops and 40 offices, including 14 restaurants and pubs and another 36 international food vendors inside of the Quincy Market Colonnade. After lunch, there are even more places we could have seen in 1962 that are connected with the American Revolution. The Boston Common was founded in 1634 and is the oldest city park in America. In its early years, it was used for grazing cattle, which, because it was free, led to the disaster of over-grazing. This led to a limit of 70 cows at a time in 1646 and a formal ban on cows in 1830. It was also used as an encampment for eight years by the British just before the American Revolution, from which they left for the Battle of Lexington and Concord. In the 1860s, the park was used for Civil War recruitment and anti-slavery meetings. And during World War I, victory gardens were cultivated. Boston Common has also always served as a place for free speech and there are plaques and memorials throughout the park for various events. Martin Luther King Jr. and Pope John Paul II both made speeches here. Concerts are often held and you can ice skate in the winter or play in the spray pool of the Frog Pond in the summer. Another historical park is the Public Garden, adjacent to Boston Common. This was the first botanical garden in America and was created in 1837. The form, plantings, and statuary all show the garden’s Victorian heritage. The seasonal floral displays are the legacy of the garden’s second superintendent, William Doogue, who guided the Public Garden from 1878 until his death in 1906. He practiced a “gardenesque” style of landscaping, using extravagant and ornamental plantings, with flowers and foliage massed together in elaborate patterns. But of all the flowers in the Public Garden, the tulips are perhaps the most historical, going back to its earliest years . The prize tulips that bloomed around 1840 were imported from England and were said to be the first such display in America. Today, the blooming of 26,000 tulips in the spring is one of the most photographed views in Boston. The garden also hosts many sculptures in a variety of styles and the Swan Boats. The Swan Boats began operating in 1877 and are a tourist attraction you can ride around the pond in. They were started and are still run by the Paget family. The 20-minute ride is pedaled by a tour guide and you can watch the real waterfowl on the pond. Also on the Freedom Trail is the Battleship USS Constitution and the nearby Bunker Hill Monument and Museum. The USS Constitution is a wooden-hulled, three-masted heavy frigate of the United States Navy. It was named by President George Washington and is the world's oldest commissioned naval vessel still afloat. It was launched in 1797 and is one of six original frigates authorized by the United States Congress. It is nicknamed “Old Ironsides” and your visit will be guided by active US Navy sailors who act as historians to inform you about the ship’s past. The Constitution was retired from active service in 1881, and served as a receiving ship until 1907, when it was designated a museum ship. She has continued to sail for special occasions, including in 1934 on a 90-port tour of the country, in 1997 for her 200th birthday, and in 2012. Current museum exhibits include information on construction of The Constitution, A Sailor’s Life in 1812, and restoring the ship. 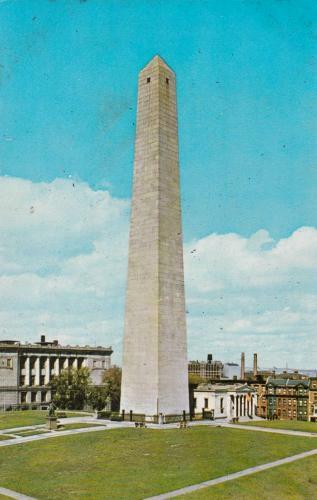 Bunker Hill Monument is a 221-foot granite obelisk completed until 1842, commemorating the Battle of Bunker Hill of June 17, 1775. The battle was the first major battle of the Revolutionary War. The hill is the site of a temporary earthen fortress known as a redoubt, where Provincial soldiers from Massachusetts, Connecticut, and New Hampshire wounded or killed around 1,000 British soldiers, out of some 2,400 who engaged them. The British won the battle but the Provincial soldiers showed they could organize well enough to fight effectively. The cornerstone of the monument was laid in 1825 by Revolutionary War hero Marquis De Lafayette. Located across from the Monument is the Battle of Bunker Hill Museum. The museum is a more recent addition, opened in 2007. It houses dioramas and murals, and artifacts from the battle. I think it’s finally time to see something in Boston that isn’t related to the Revolutionary War. Let’s look at some museums! The Isabella Stewart Gardner Museum opened to the public in 1903 and has more than 2500 items in its collection. The collection spans painting, textiles, and furniture. During Mrs. Stewart’s lifetime, the gallery installations were very different than they appear today. She often mixed objects from different cultures and periods among well-known European paintings and sculpture. Isabella Stewart Gardner amassed her collection during extensive travels. She was a patron and friend of leading artists and writers of her time, including John Singer Sargent, James McNeill Whistler, and Henry James. The building was designed to emulate a 15th-century Venetian palace, as Venice was her favorite overseas destination. 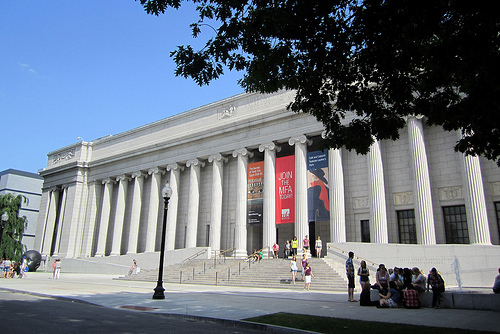 Another art museum, the Boston Museum of Fine Arts, was opened in 1876 and moved to its current location near the Isabella Stewart Gardner Museum in 1909. There are eleven different collections, including art from America, Europe, Asia, and Africa as well as photography, musical instruments, and drawings. American artist John Singer Sargent painted the frescoes that adorn the rotunda and the associated colonnades. Some highlights of the collections include French impressionist and post-impressionist works by Paul Gauguin, Renoir, Monet, and Van Gogh; Egyptian artifacts, American art including John Singleton Copley, Winslow Homer, and Gilbert Stuart; Chinese painting, calligraphy and imperial Chinese art; and the largest museum collection of Japanese works under one roof in the world outside Japan. The museum we see today has been greatly expanded since 1909, with multiple additions, including the latest one in 2010. Boston’s Museum of Science was founded in 1830 in temporary facilities, and had its first permanent building constructed in 1862 as the New England Museum of Natural History. The current museum opened in 1951 and is now one of the world’s largest science museums. It includes the Charles Hayden Planetarium and even an indoor zoo! Current permanent exhibits include dinosaurs (of course), birds, butterflies, light, mapping, and The Hall of Human Life. There are over 700 interactive exhibits! They also have live demonstrations frequently during the day, including the world's largest air-insulated Van de Graaff generator in the Theater of Electricity, donated by MIT in 1956. If you’re looking for more animals than the Museum of Science’s indoor zoo can hold, you can stop to the Franklin Park Zoo. Franklin Park Zoo was opened to the public in 1912, and managed by the City of Boston until 1958, when the Metropolitan District Commission (MDC) took control. Franklin Park was designed by landscape architect and planner Frederick Law Olmsted, who included a future zoological garden. This planned garden was not a traditional zoo and was later changed to include more exotic animals. Many changes and additions have been made over the years, such as the Children's Zoo, which opened in 1962. The zoo now features more than 220 species of animals in a linear walking arrangement on 72 acres. It does not have modern naturalistic settings that some newer zoos have. There’s also a playground, carousel, and a tram ride. And though it might be nice to add the New England Aquarium to a day of animals, it did not exist in 1962. It was in the planning process that year, but did not open until 1969. I left one place for last along the Freedom Trail because it was not directly involved in the Revolutionary War. But the Massachusetts State House does have connections to war figures. It was completed in 1798, built on what was originally John Hancock’s cow pasture. 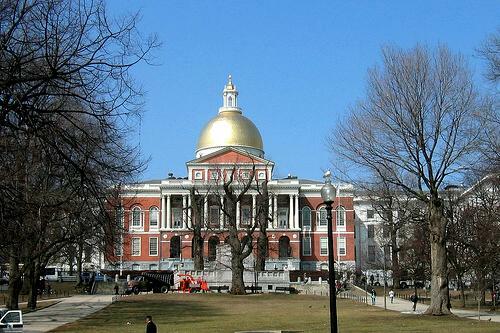 The golden dome was originally of copper, overlaid by Paul Revere, but has since been gilded. Besides the state legislature meeting here, the building houses the offices of the Governor of Massachusetts. A major expansion was completed in 1895 and in 1917, the east and west wings were added. The second floor under the dome is decorated with murals by artist Edward Brodney, done under sponsorship of the Works Progress Administration in 1936. The mural is entitled "Columbia Knighting Her World War Disabled." The marble-floored corridors are lined with portraits of Massachusetts governors, and there are statues of colonial figures. You can see this and more, as tours are available. Our last stop of the day will keep us busy until after dark, and provide dinner. We’re going to Fenway Park to see a Boston Red Sox night game. Fenway has been the home of Boston Red Sox baseball since 1912. It is now the oldest ballpark in Major League Baseball. Because of its age and tight location in midtown Boston, the park has been renovated or expanded many times, but it is still the fourth smallest among Major League ballparks by seating capacity. These changes have also given the park some quirky features including "The Triangle" and, most famously, the Green Monster in left field. The Green Monster is the nickname of the left field wall. It is only 310 to 315 feet from home plate, a short distance for Major League ballparks, and has been said to benefit right-handed hitters. Guided, one-hour walking tours of the park are given, but we’re here to eat and watch a game! 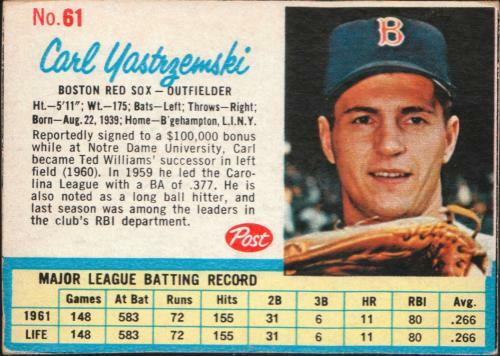 The Red Sox finished 8th in the American League in 1962, so there were no World Series games here that year. See you later on Roadtrip-'62 ™ and maybe I’ll remember to tell you who won tonight’s game. I’d like to thank Jesse Miller for the inspiration for this article. Her article has a lot more ideas on fun things to do, both old and new, all over Massachusetts. Maybe it will inspire you also.